What on earth was Jun Takahashi thinking when he styled his Fall 2014 UNDERCOVER collection for the runway? Apparently he cited, royalty, fear and witches, with each playing a significant role in his final multi-faceted statement. Takahashi crowned his pale, frail-looking models with bejeweled hair-braided tiaras, a creation of hairstylist extraordinaire Kamo. Their frightful blood-red glares came courtesy of contact lenses and dripping red mascara and if that wasn't enough drama for you, some models seductively carried electronic evil apples taking us back to our childhood dread of the Disney fable Snow White. 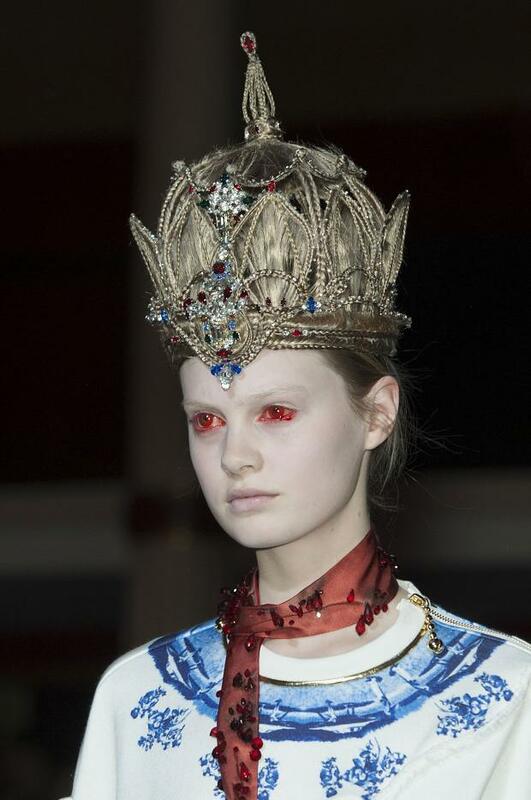 Fashion fairy-tales aside, all I want to know is how do I get my hands on one of those headpieces? Draped in Undercover's fall finery, I'll be ready to take my spot on the throne as Style-Queen For a Day.